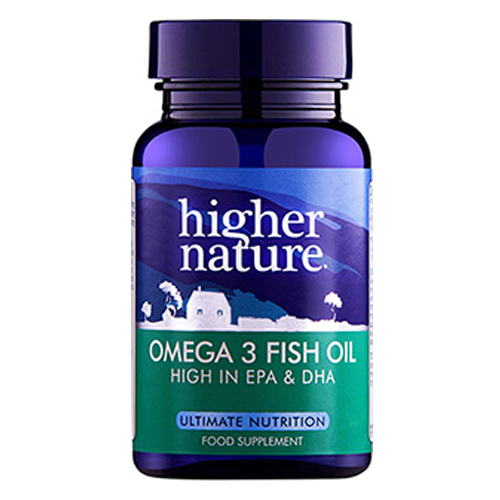 Higher Nature Fish Oil is a premier quality omega 3 fish oil that provides a good ratio of the omega 3 fatty acids EPA and DHA. Crucial for the support and maintenance of proper hormonal, metabolic and neural function. Our modern diets provide up to 20 times more omega 6 than omega 3, more than at any time in our history. But omega 3 is vital for the support of proper brain function, healthy skin and many bodily functions. This premium fish oil provides a good ratio of the omega 3 fatty acids EPA and DHA. This premier quality fish oil is scrupulously screened for PCBs and other pollutants to ensure the highest standard possible. You will not find a purer fish oil. Omega 3 fish oil (antioxidant: natural mixed tocopherals); capsule shell: gelatine, glycerine; antioxidant: d-alpha tocopherol (Vitamin E). Take 1 - 3 capsules (children over 8 years, 1 capsule) per day with meals, or as your health professional advises. A daily multivitamin is also recommended. Below are reviews of Omega 3 Fish Oil - EPA and DHA - 90 x 1000mg Capsules by bodykind customers. If you have tried this product we'd love to hear what you think so please leave a review. Very good quality fish oil and a good price. 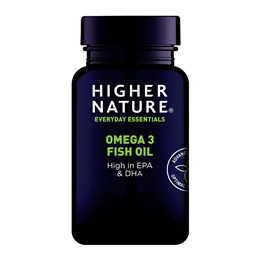 Question about Omega 3 Fish Oil - EPA and DHA - 90 x 1000mg Capsules Is the oil from wild or farmed fish? Question about Omega 3 Fish Oil - EPA and DHA - 90 x 1000mg Capsules Are there any omega 3 products available for vegetarians in capsules?